I’m sure there are few bikers who wouldn’t want to take their bikes onto a super smooth track, with no speed limits and great corners to tip into. However, I’m also sure there are many lesser experienced bikers who are a little nervous or put off booking a full on track day. If you’ve only got a little street bike for commuting or are not a confident rider, you will likely be daunted by the idea of hitting the track with loads of race replica, crotch rockets, fresh out of tyre warmers and fuelled on testosterone and macho posturing. Undoubtedly they prefer teaching bikers to ride better, than cleaning up motorcycle mess off the roads when things go wrong. 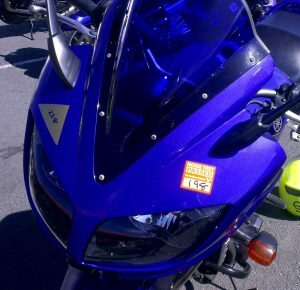 It’s not what you ride, but how you ride (but that ZZR1400 was fast!). The day set me back a measly £55, which is an absolute steal considering everything covered. Registration at 8:30am and finishing up around 5:30pm, with only a few short breaks throughout the day, it was definitely a jam packed day. We were all split into 4 groups of around 8 and cycled through the sessions, with the exception of the track sessions where we joined up again. It was a good mix of people on the course, young, old, novice, seasoned riders and not just one token female, rather a refreshingly good gender split. 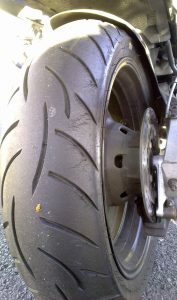 Ditto the bikes, everything from CBR’s, CBF’s, Fazers, GS’s, Panigale’s, Monsters and even an 80’s BMW R100RS. You really don’t need a sports bike to go on track. The first aid session was a brief session taken from Kent Fire Services famed Biker Down course. Essential skills that could help you save a mate who has taken a tumble. We took it in turns practicing helmet removal and had a quick refresher of CBR chest pumps. I found this a good aide memoire of the full Biker Down course I attended a couple of years ago, but others may find it too brief. The class room theory session was run by Kevin Williams (of Survival Skills fame), and encouraged us to think deeper into reading the road ahead to predict hazards that may be lurking around the next bend. Common sense stuff, but easy to forget on the road, causing panic stations as you race into trouble. Being a full IAM member already, I was no stranger to the format of the observed ride. However due to time constraints we only had half hour out on nearby roads, followed by debrief and constructive feedback. It had been over a year since I last had an observed ride, so it was great to get feedback on how my riding standard now compared. Thankfully, still pretty reasonable with only a couple of minor niggles to be mindful of. 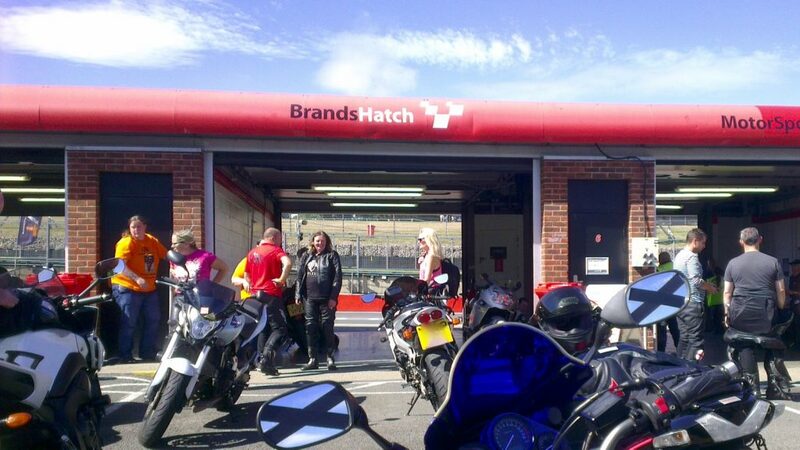 Finally we had two 20 min sessions on the Brands Hatch Indy track, which of course included a bike noise test, some briefing on rules, flags etc. 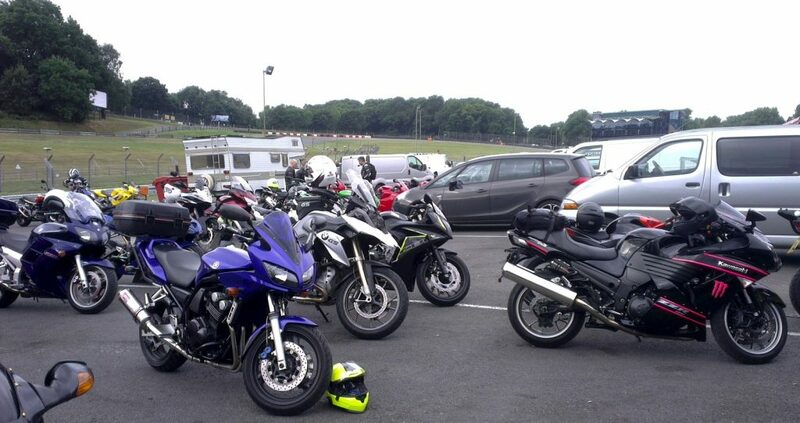 For the first session we were split into two groups based on experience, then out on the track the Kent Fire Bikes led some sighting laps where we could familiarise ourselves with the bends. After they would invite riders to follow their lines to improve their position and help carry more momentum through bends. The sessions were very relaxed, with no competitiveness, and overtaking reserved only for the straights with a healthy respect for personal space. On the first session I was definitely a little tentative, taking it easy as I gradually got used to the track and how my bike could be pushed. But 20 min flew by super fast, leaving me in the pits with a huge grin and eager to get back out. in the pits with a huge grin and eager to get back out. Prior to the second track session, the Kent Fire crew talked us through further techniques to help improve our riding on the track; touching briefly on stuff like body positioning, gear choice, braking, to lines on the track. During the second track session, confidence was higher, we had a multitude of tips to try out on the now familiar short circuit. My pace was definitely faster, my lines were getting better and I tried to concentrate on moving my arse left and right ready to hang off for the bends. Something I just never normally do and I struggled to get the hang of, but did start to see the benefits of. Definitely got some way to go before I get my knee down… The only minor negative was the track did feel busy at times, with some bends getting congested. It really felt like a full on day, which was great even if a bit of an information overload at times. Having touched on so much, the take home feeling was the urge to pursue more. 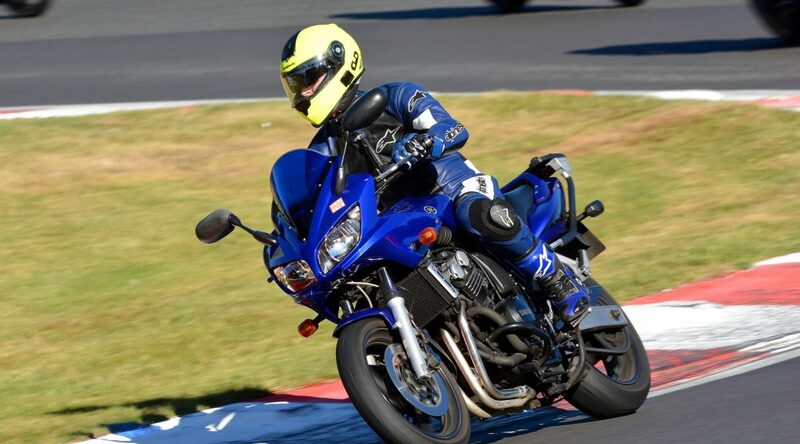 I still gained a lot from the day, but now I just want to practice new techniques and tips, jump on more in depth courses and do more track days. At £55 for the day, it really is a bargain, and highly recommended for anyone with little or no track experience. Look out for upcoming Kent Fire & Rescue Skills Days at MSVT.